Caring for my mother who suffered from Alzheimer’s disease for 13 years was the most profound experience of my life. I began to understand what it really meant to be in the moment. Simple things carried great meaning — holding Mom’s hand, hearing her say “I love you,” being quiet in the same room, sharing lunch in our backyard on a sunny day. Photography has always been a creative outlet for me, as it had been for my dad, although I resisted taking pictures of Mom at first because I was afraid that she might not appear as I remembered her; I was afraid of what I might see. Instead, my first black-and-white portraits of Mom and her caregiver Krystyna embodied so much love that I wanted to capture more. 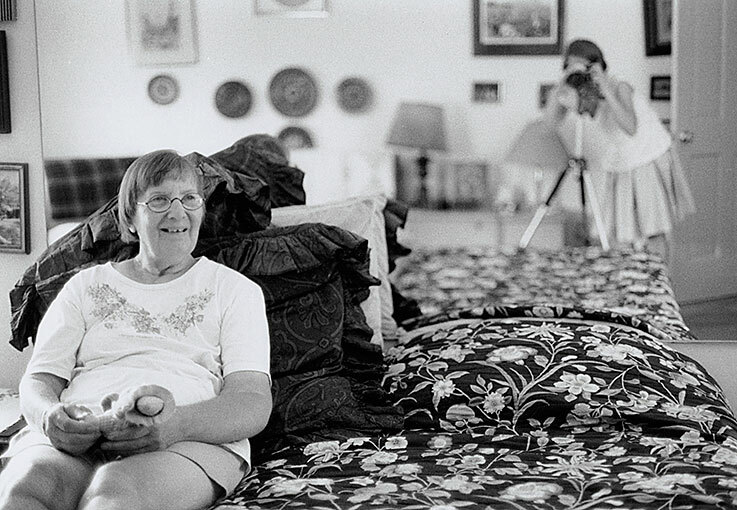 And so began my seven-year journey of documenting Mom as I moved back home to care for her. I shot all the images on film with my dad’s camera then printed them manually. When I was printing in the darkroom old-school style, I saw Mom come to life in a way that is not often felt in today’s digital age. The camera revealed beautiful moments between my brother John and Mom that gave me comfort. It was also with me during the most painful days. At times, Mom looked directly at the camera and I felt like she was there. In the first (and only) Thanksgiving that Mom was in the nursing home, with its institutional, fluorescent-lit cafeteria decorated with construction paper turkeys, my film got exposed. I felt a loss because that critical day wasn’t recorded — and I wished we were back home making the Martha Stewart turkey recipe that Mom loved. We’d always break out the good china. It’s been seven years since Mom passed, and I wanted to keep printing images forever. Part of me wanted to get this show out sooner, but I kept holding on, saying one more print. I know I needed to let go of the process, but that doesn’t mean letting go of Mom. The camera allowed me to freeze time, to feel deeply, to love, grieve and be present in a way that I will never, ever forget.